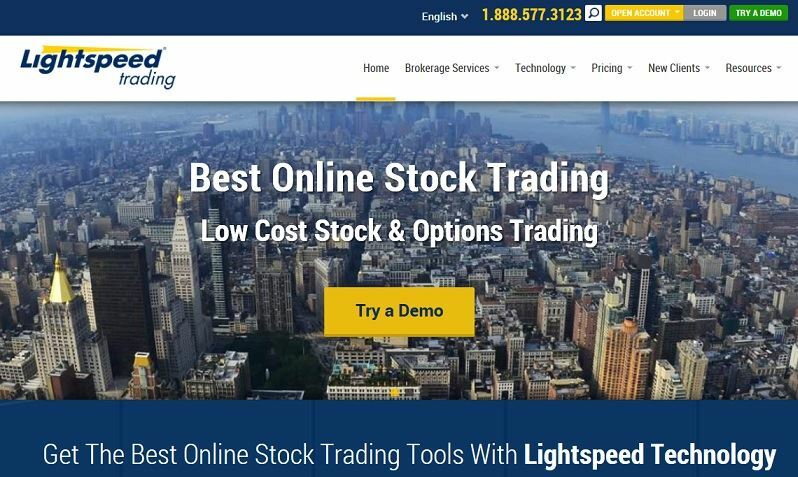 Lightspeed Trading Review – Faster Than The Speed of Light? When it comes to day trading, Lightspeed Trading is without a doubt one of the most coveted brokerage accounts to own in the United States. This is because of the extraordinarily fast execution the Lightspeed is known for, and quite frankly continues to lead the pack in. The type of trade-execution you get at Lightspeed is something that was once only offered to hedge funds and Wall Street traders. This Lightspeed Trading Review reveals all you have to know about this brokerage account. There is a high bar to entry though, meaning that the initial funding requirement is $25,000. Obviously, if you don’t have that kind of trading capital, Lightspeed isn’t going to be for you. Lightspeed Trading is an extraordinarily professional broker and offers some of the best platforms in the world. Execution speed is phenomenal, and the ability to send your orders to well over 100 destinations is a huge plus. This isn’t the same thing as buying and holding AT&T. This is a place where traders come to when they need to be in and out of the market in seconds, and without worries about being filled. They are heavily regulated and are even over insured, meaning that your trading account will be secure. In fact, the Securities Investor Protection Corporation coverage for each client is typically $500,000. However, each account at Lightspeed is covered all the way up to $25,500,000 at no extra charge. This is a brokerage firm that caters to professional retail traders, hedge funds, RIA’s, and a whole host of other very demanding clients. For years, this has been the place for American traders to put money to work. 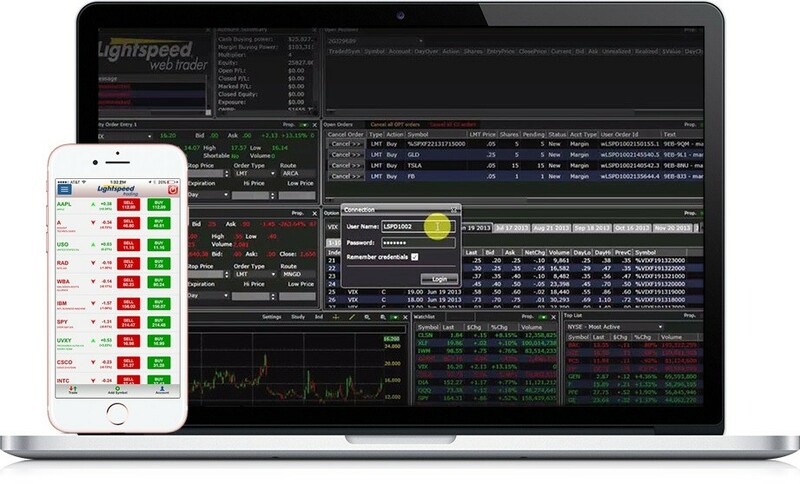 Lightspeed has an absolute ton of options when it comes to trading software and platforms. There is the standard Lightspeed Trader, which can send trades for stocks and options to over 100 routing destinations. It offers complex options trading, integrated charting with studies, multithreading for hyper speed, plenty of advanced scanners and filters, and of course is highly customizable and even has research capabilities. There is also the Lightspeed Web/Mobile trader, which has similar features to the Lightspeed Trader platform, only in a mobile flavor. This allows you to access your count on the go, offering real-time buying power display and streaming quotes. There are plenty of charting and options chain abilities as well and keep you in the know while out and about. For those of you that may be more inclined to trade options only, there is the Livevol X Options Trading platform, which can monitor risk dynamically, offer trade analysis, analytics with historical data, and live order flow information. 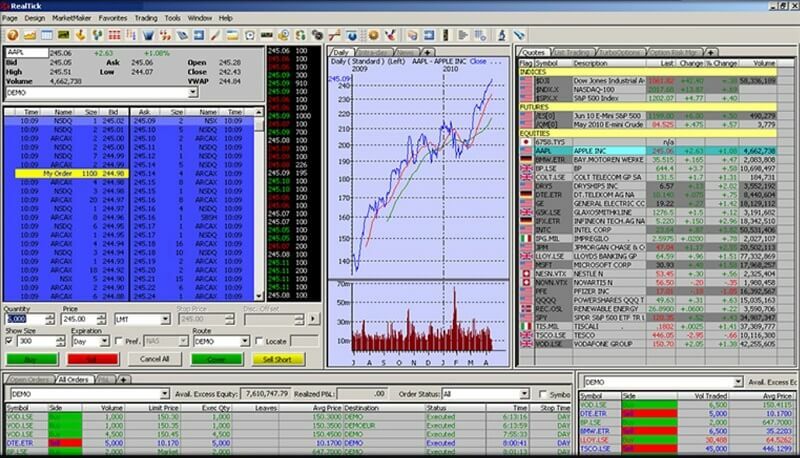 There are plenty of option market scanners and analytic components that come along with this platform. Sterling Trader Pro is a full-featured Level II trading platform designed for professionals that work with the rapid market order flow that is prevalent in today’s stock markets. It has an advanced charting package, highly customizable level II order entry system, programmable keys, and load order entry features for immediate reactions. Real-time profit and loss information, as well as an API for connection to custom and third-party applications. The next platform is RealTick Pro as well as RealTick Express. This platform was created by Townsend Analytics, which is used by professional traders. It suited to active traders, as well as hedge funds. It delivers sophisticated trading tools, unrivaled access to liquidity, real-time data, charting, and streaming news. Advanced order entry is available, and it’s extraordinarily customizable, making it an excellent platform. However, it does come with a $325 monthly software fee, so keep that in mind. Lightspeed Gateway is a fully automated trading system, which allows you to trade your algorithmic systems. This is a platform that is based solely upon volume, so your mileage may vary. Beyond that, there is a handful of other specialized stock in options trading software packages available, as well as RealTick for futures, and CQG for futures. The massive amount of software available at Lightspeed is one of the most significant advantages to trading there. Lightspeed Trading offers stock, ETF, options, and futures markets in the United States. Because of this, most of the rallying goes through New York City, but apparently the futures market is more Chicago-based than anything else. There are excellent commissions schedules based upon volume, so the more active you are as a trader, the better off you are going to do as far as expenses are concerned. ​Regulation T and Margin Account: The Regulation T allows borrowing of up to 50 % of the purchase price of securities that may be purchases on margin. This is often called the initial margin. ​Portfolio Margin: The SEC-approved portfolio margin rules permit margin requirements to reflect the actual risk of the entire portfolio in a specific brokerage account more accurately. This will enable qualified customers to increase their leverage beyond the 4 to 1 intraday or the 2 to 1 overnight margin being available in a standard margin account. ​Separately Managed Account (SMA): This is an account for clients who need a customized solution to meet specific investment needs. DVP/RVP: This is created for delivery versus payment or for receipt versus payment. Here, Lightspeed Trading offers a wide range of DVP services. CMTA Agreements: These are agreements by which an investor may enter derivative trades with a limited number of different brokers while, later, he may consolidate these trades with one brokerage house for clearing. Thus, clients really have a choice to use an account type that meets their needs in the best possible way. Lightspeed Trading offers some of the best commissions you will find in the US. The standard fee for options is $0.60 per contract, but if you trade more than 500 contracts per month, you can get even lower rates. Those who trade more than 100,000 contracts per month will pay just $0.20 per contract. The rest of the commissions come down to volume as well on stocks and ETFs. These can be as cheap as $0.0010 per share if you trade over 15 million shares. Commissions per trade start at $4.50 and extend all the way down to $2.50 on more than 10,000 trades if you are being charged per trade and not per share. You will need to do the math to understand which one works out better for you. Futures commission start at $0.60 per contract per turn if you trade under 500 contracts a month. If you trade over 50,000 contracts, you can get as cheap as $0.30 per contract. Again, a bit of mathematics will be needed to figure out what your cost may be. One thing you should be aware of is that data feed does cost extra, as it does with many professional brokers. It can be anywhere from $10-$70, and even all the way up to $120 depending on your classification, and the type of data feed that you are looking for. However, for most of you it will probably be somewhere along the lines of $10, perhaps $25 for the standard trader. If you use the Web Trader, the data feed is free for the non-professional trader, so that’s something to keep in the back of your mind. If you are a registered professional trader, then you will naturally be well aware of the fact that data costs extra for the pros. The pricing options are complex. Please continue your research on the Lightspeed Trading website and calculate your individual prices based on your trading volume. Surprisingly, as professional as lightspeed Trading is, there is a rather large education section. There is a getting started section, trading strategy section, FAQs, and even online classes. They also are known for their live webinars and inactive trading blog that is followed by quite a few people. There are a handful of trading tools, including TipRanks and Hammerstone Markets, both of which are strong analytical firms that can help you with your trading decisions. This is rather interesting, considering just how professional this service as a broker is, but at the same time, they offer quite a bit of trading help. The Customer service at Lightspeed Trading can be reached via the phone number, email, webinars, tutorials, and service FAQs. They are one of the easiest brokerages to get a hold of and are well known for taking care of their clients at both the New York and Chicago offices. Either way, you will find that Lightspeed has been awarded several customer service awards for a reason, as they continue to strive to keep ahead of all other competitors. Lightspeed Trading is without a doubt a very professional brokerage. Robust technology exceptionally crafted for the high-volume and high-speed trading of today’s markets makes Lightspeed one of the better brokerages out there. As long as you are trading just the markets that they offer, you would be hard-pressed to find a better brokerage firm. The expenses are minimized, which for the day trader is crucial. Lightspeed has a long record of customer satisfaction and continues to bring down the average cost for the day traders out there. 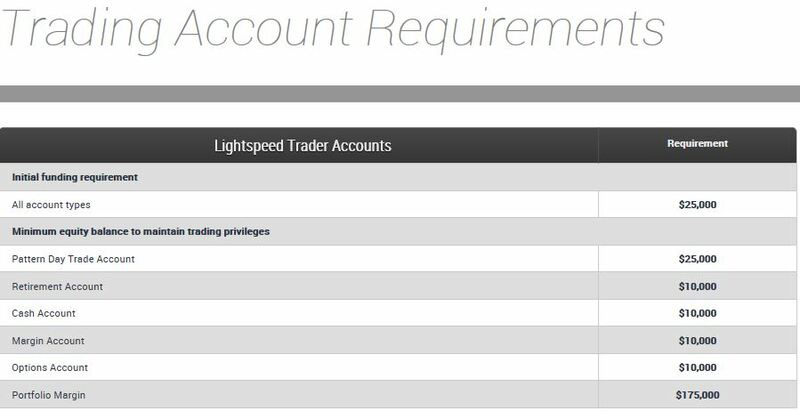 If you are a longer-term trader, then many of the benefits that come with a Lightspeed account probably don’t apply to you. There is a high bar to cross for entry, as clients need to deposit $25,000 to open an account. Unless it’s a retirement account or a few other exceptions, but still those are probably not best served here. Lightspeed Trading is about the average day trader taking advantage of deep liquidity and competitive commission schedules, something that not everybody can offer. It is an excellent idea, to combine Lightspeed Trading with Trade Ideas, the ultimate A.I. based stock screener. You can think of Lightspeed Trading like a Ferrari. It’s a great car, it’s an exotic car, and it’s an extraordinarily fast car, but it should only be in the hands of the right person. It’s not like a minivan that you take the kids to school in. Lightspeed Trading is a specialized and exotic machine. That’s pretty much the way I like to think about Lightspeed Trading. In the hands of the right trader, it is an excellent place to use. However, if you are a long-term oriented investor, then it’s probably an overkill to trade at this broker. Why? Because there are extra costs like data feeds that over the longer-term can be more expensive if you’re only placing a few trades a year.